PARK RULES * We have a NO Refund and NO Rain Checks policy. There is a standard 24 hour cancellation policy and a 48 hour cancellation policy for holidays and special events. A one night charge will be assessed if a reservation is not cancelled within the applicable timeframe. * Swimming will be allowed for park residents only, additional guests will need to stop in the office and pay $4.00 per person per day. * Check out time is 11:00 am; check in time is 2:00 pm. If you wish to check out late, please notify the office by 10:00 am. A $5.00 per hour charge may apply each hour until 4:00 pm, after 4:00 pm, you will be charged a full nights stay. * Parents are responsible for their children at all times. * Please DO NOT park or drive on the grass. * Only one RV unit and two vehicles are allowed per site, boats and/or trailers are considered an additional vehicle. Check with office for additional parking. * All overnight fees to be paid "In Advance" * Each paid overnight stay includes 2 adults & 2 children. If your overnight guests exceed this, an extra charge of $4.00 per adult and $2.00 per child per night will be charged. * Quiet hours are from 10:00 pm to 8:00 am, please be considerate of your neighbors. * All monthly RV's must be washed every 90 days, vehicles must be kept presentable. * Green Acres does allow residents to work on their vehicles as long as you can do the work within one day. Dispose of all parts and oil appropriately. * An airtight sewer boot is required. * Structures, fences, or porches are NOT allowed to be added to any site at any time. * Mats, carpets or boards are not allowed on the grass overnight. 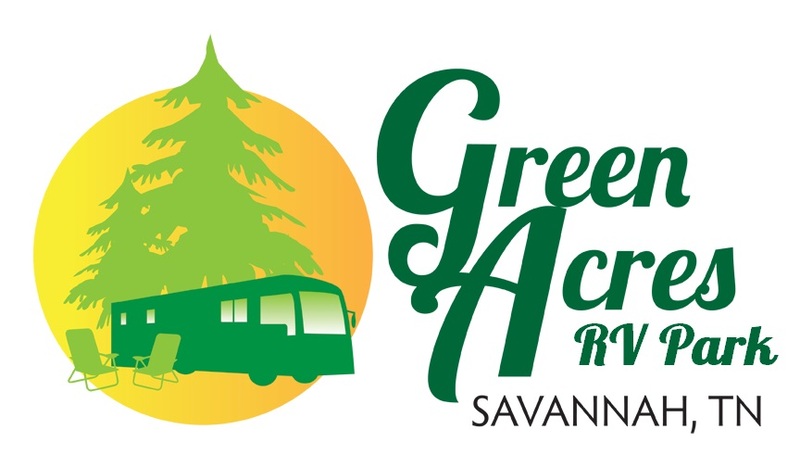 * Your RV site needs to be the same when you leave as when you arrived. A $100.00 cleaning fee will be charged if there is debris, dog waste, or cigarette butts left behind. PUBLIC RESTROOMS & LAUNDRY Unisex restrooms/showers are available 24 hours. Hand laundry or dishes are not allowed to be done in restrooms or laundry room. Laundry room is open 24 hours per day 7 days per week. Please help us keep this area sanitary. Hanging out laundry is not permitted. SMOKING Smoking is not allowed in the office, pool, restrooms, laundry or showers. Cigarette & Cigar butts ARE considered litter, please dispose of them accordingly NOT on the ground! PETS Pets and their responsible owners are welcome but must be kept on a leash (8' maximum) and cleaned up after immediately. Pets are not allowed in restrooms or showers. Do NOT leave pets unattended. Management reserves the right to limit size and/or aggressive breeds. Please keep your pets quiet and do not allow uncontrollable barking. Monthly residents must obtain management approval to all animals before taking them in. FIRES Fires are allowed providing they are contained in a unit and are off of the grass. You can purchase wood in the office if you forgot to bring it with you. We also have fire pits you can borrow during your stay. Please be considerate to your neighbors, some cannot tolerate the smoke. TRASH Place trash out at the end of your site by 11:00 am and our staff will pick it up. Our dumpster is unlocked until dark. If you have trash after 9:00 pm, please place it in cans outside of the front office. Do not leave trash out overnight. POOL The pool is intended for the enjoyment of all registered guests. There is no lifeguard on duty. Pool rules must be observed or you will be asked to leave the pool. ONLY swim wear is allowed in the pool, children that are not potty trained must wear swim diapers. No foul language, pets, glass, food or smoking in pool area. Please help us keep area clean. Swimming will be allowed for park residents only, resident's guests, wanting to swim will need to stop in the office and pay $4.00 per person per day. All children under the age of 14 and younger MUST be supervised by an adult at all times. Pool will close 15 minutes before dark each night and be available for your enjoyment by 10:00 am each morning. OTHER No dirt bikes, 4 wheelers, skateboards or rollerblades allowed in park. We do not tolerate profanity or drug use. Please do not cut through campsites. Speed limit is 10 MPH throughout the park, there are children at play; please make sure you adhere to this. GENERATORS AND FIREWORKS ARE NOT PERMITTED This is private property. Violation of these policies or generally antisocial behavior not covered herein may result in you being asked to leave the premises. We reserve the right to enforce our rules and refuse to register undesirable guests. If evicted, NO REFUND. Your help by adhering to these policies is a vital part in helping us provide a safe, secure and enjoyable property. DISCLAIMER The camper accepts camping privileges with the understanding that he does hereby release the Campground, its officers and employees of all liability for loss or damage to property and injury to his person arising out of his use of its camping facilities, and agrees to indemnify the Campground, its officers and employees, against claims resulting from loss or damage to property or injury to the person of any member of the family or guest of the registered camper arising out of the use of its camping facilities.